Craft beer brothers! I’ve returned from Mordor, and with good news! Hopes springs eternal in the seat of ultimate darkness. By which I mean—St. 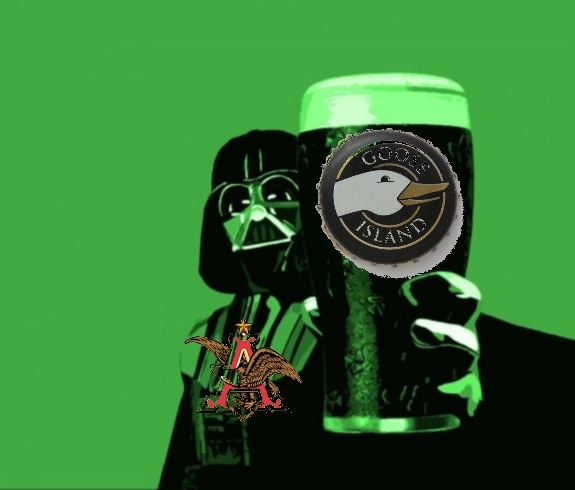 Louis, home of the Evil Empire, has become a really great town for craft beer. I took a two-day trip to St. Louie last week, planning what was essentially a miniaturized version of my previous beer trips, like my four-day quest into Michigan this spring. This time, I put my already fearsome degree of planning into serious overdrive mode, seeking out a number of audiences with brewery owners and brewers ahead of time. Using the advice and contacts of St. Louis Post Dispatch beer writer Evan Benn, author of the awesome St. Louis beer blog Hip Hops, I got in contact with the owners of three brand new breweries and arranged to meet them on the first day. Here is the itinerary of my two-day trip, complete with tasting notes and photos. That’s what you get at Aleheads–the full service. Interviews with the founders of Civil Life Brewing, 4 Hands Brewing and Perennial Artisan Ales will follow in the near future, whenever I get a chance to type them all up. So without further ado, on we go! I woke early and departed quickly, determined to start consuming beer at an hour that I would normally just be arriving at work on an average weekday. I arrived in St. Louis at the brand-new Civil Life Brewing at around 9 a.m., and was enthusiastically greeted by St. Louis native and brewery founder Jake Hafner and assistant brewer Mike Bianco. They were busy setting up for the evening, because in a completely random coincidence, I had arrived on the day of their soft opening which would be taking place later in the evening. Incredibly, it was the same story later at Perennial, which is insane considering that I scheduled this trip some six months ago. Clearly, the gods are favoring my drinking expeditions. That’s a table with little tasting glasses set up, and I joined Hafner and Bianco for tastes of a couple beers straight from the fermenters. — Civil Life ESB: An extra special bitter that is fairly mild for the style with a nice biscuity character. Uncarbonated and with an unusual British yeast character that I couldn’t quite place. 2.5 hops for now. I’ll have to try this one again sometime. 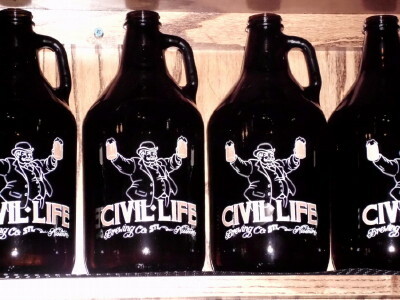 That was all The Civil Life had on when I visited, but they’ll be expanding their lineup with more classic session brews in the near future. They’re looking to carve out a name for themselves as a great place to stop with friends and linger. From Civil Life, I made my way to 4 Hands, a brewery with a very different, more extreme philosophy. That’s what’s so great about what’s going on in the St. Louis brewery scene these days–there’s a ton of variation. While one place like Civil Life focuses on session beers, other new places like 4 Hands and Perennial handle the more esoteric, out-there brews, of which St. Louis does not yet have a ton. But that’s soon to change. Sadly, the only brew I was able to sample was their single-hopped centennial pale ale, which they call more of an American red ale. This place, I’ve actually been to a number of times, because I occasionally will go to St. Louis for shows at Off Broadway, a cool music venue down the block that caters to my weird taste. 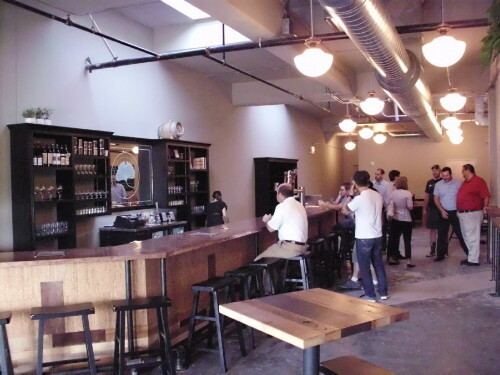 The Stable is so named because it exists in the former stable buildings of the now defunct Lemp Brewery, and it fancies itself a brewpub, which some might disagree with. In reality, it’s more of a beer bar then a true brewery, and it’s a good beer bar with interesting specials in particular. 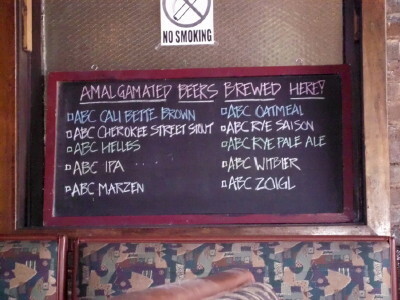 For instance, on the day I came in, it was half-off all IPAs, and the draft list is quite extensive. When it comes to their own beer though, they seem to have a curious problem…they don’t really seem to brew it too often. The only beer that can be counted on to be on draft is the helles, which is actually a tasty brew that I’ve had before. The only other one I’ve ever seen on is the “Zoigl,” which I sampled here. A bunch of cryptozoological beers. 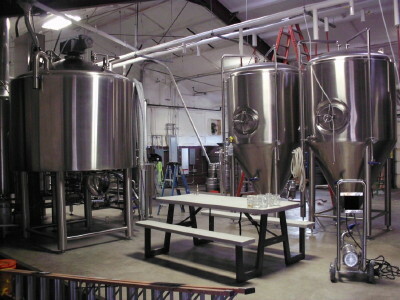 There are tables in the back, and when you turn right you stroll into the brewhouse. Here I met Perennial founder, the surprisingly youthful Phil Wymore, who was a brewer both for Goose Island (he worked with Will Johnston of 4 Hands) and one of my Chicago hometown favorites, Half Acre Brewing. These are the kind of credentials I like to see. Here they were pouring full beers (finally) to everyone assembled, along with tastes of special beers and a few guest drafts. 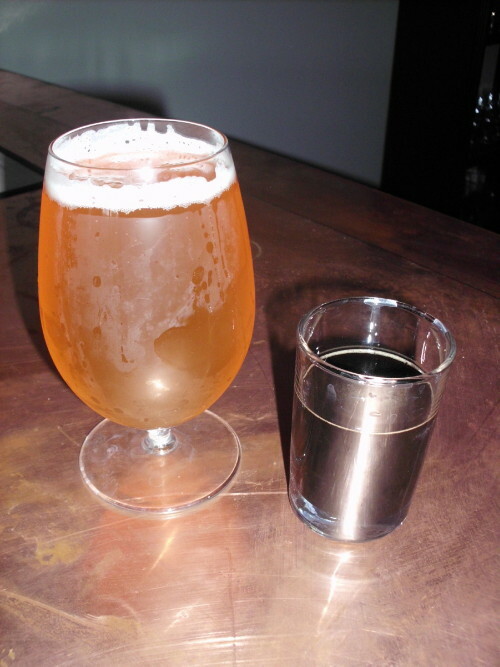 I took the chance to try everything that Perennial had to offer, plus a beer from 2nd Shift Brewing*, a new brewery situated well outside the city that I made a point to seek out over these two days when I could. *Ignore their insane website design. I’m pretty sure they are not actually insane. On the left, Hommel Bier, on the right, the mighty Abraxas. That’s all for Day I of my St. Louis trip! Technically I hit one more brewery that day, but because I visited that same place again the next morning, I’ll combine it all into Day II, and get it up in a few days. Then, I’ll attempt to get 3-4 in-depth brewer interviews collected during the trip up within the next month or so. Wish me luck. There’s a lot of tape. Best to go out and get one of these beers while you wait. 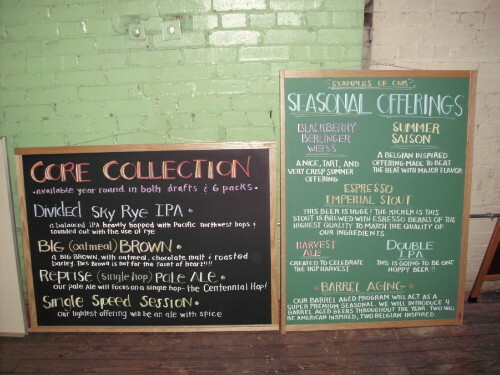 Posted in Ale Factories, Alehouses, Tasting Notes.Tagged 4 hands brewing, civil life brewing, jake hafner, kevin lemp, lemp brewery, perennial artisan ales, phil wymore, st. louis beer, st. louis breweries, the stable st. louis. Very good stuff. Notably absent from your tastings- a bunch of IPAs. Kudos to these St Louis brewers for trying to blaze their own trail with some interesting styles. I was at the Civil Life soft open, because they are in my neighborhood. I was outside in the beer garden with my dog, a neighbor, and his dog. Did you see us? I did go inside to get my second beer, after that we CHRISTENED the outside order window. Oh, believe the website, the 2nd Shift guys are most certainly insane. 🙂 They make some damn great beer though and we love them for that. Hah, well I certainly got both of those impressions. If I could have visited any other brewery in town besides the places I got in those two days, it would have been to 2nd Shift, but it was just a bit out of my way. But that is definitely one of the weirdest brewery websites out there.